Brooks makes an incredible product for women of all sizes. Certain bras are made to resemble regular bras with clasps in the back, some are racer back with clasps and some are regular racer backs. Some are made for women with smaller chests and some are made specifically for larger breasted women. Having the right sports bra is incredibly important for running because not only does it provide support, but it also helps prevent a lot of bouncing in an area that is not necessary. As with all Moving Comfort bras, they are sized as any normal bra would be ie, A, B, C, D+. Support is very important to me when running as well as not chafing. I have tried many different sports bras throughout the years and I have struggled to find ones that don’t chafe, create cuts, etc. This bra is made a little different then other lululemon options. first, it is low cut, second it is a little thicker in material but it hugs you well, the material around the cups is supportive for running, and I never felt like the straps were too loose. I did have to size up in this bra but every bra is different. Plus when you sweat it fits itself to your body to make it comfortable and it does a better job of supporting my girls. This bra comes in specific sizing of C/ D.
This bra is more on the thicker side, but it provides a great amount of support. With a hook and clasp in the back to make getting it on easier, as well as a racer-back style, this is a definite favorite of mine. CWX makes compression products and I was excited to test this out because I need my girls to stay in place and comfortable while running and this bra definitely does its job. 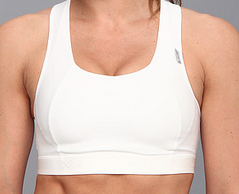 This bra starts at a 34B/C and goes to a 38DD and was made for medium to high-impact sports. I was hoping to fit in this bra and I barely made it. Because of my size and my small shoulders, I typically have to go down in size if it is not made by the cup. But I did enjoy this bra and the way it was made. It’s made with great material and is very comfortable. It is a racerback bra that comes in three different colors, the cups are molded and the bra is made with compression. It is more of a medium support, but I enjoy running in it because my girls stay in place.